A FINE UNMOUNTED MINT BOOKLET. We appreciate your cooperation with this. Yes we do. We will combine over a 2 week period. COMBINING ORDERS. Direct communication is always the best way to fix an issue. AND ALL POLICIES. If there is a fault we will describe it. Norfolk Island - 2006 - Dogs of Norfolk Island - Set of Four Value's. S.G. 967 to 970. Norfolk Island - 2006 - Dogs of Norfolk Island - Set of Four Values. UK: £0.00p. First numbers on title are Scott catalogue. Second numbers are Stanley Gibbons catalogue. Asking price for this item is only 25% of Scott 2018 catalogue value. MH = Mint Hinged, MLH = Mint Lightly Hinged, MNH = Mint Never Hinged. (Norfolk Island 2013 Church Bell - Mint Never Hinged (MNH). You will be back for more! 3) Select each item and 'Add to Basket'. 40th Anniv. of RNZAF Flight Squadron in Pacific dated 30/4/82 signed & unsigned covers. Fine condition. 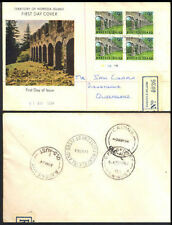 NORFOLK ISLAND, AUSTRALIA, 1964, 50TH ANNIV. Norfolk Island, Mint never hinged. NORFOLK ISLAND, 1976. Cover 256, Norfolk. Norfolk Island, 1976. 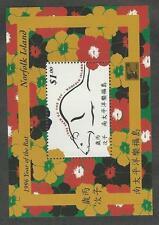 Cover franked by Scott 256 tied by Norfolk Isalnd favor cancel 9 FE 76. Topic - "35c -VIEWS ON NEPEAN ISLAND". Norfolk Island. SCOTT #289. Very Fine Condition & Centering. Mint Never Hinged. Issued 1982. Very good condition, Mint Never Hinged. Centenary of the Landing of the Pitcairn Islanders on Norfolk Island. NORFOLK ISLAND 1956. Mint, never hinged. Scott No. : 461. Stanley Gibbons No. : 469. No Exclusions. -:- The item you receive may not be the item scanned, but will be of similar quality. Year of issue: 1989. Here is a mint never been hinged set from Norfolk Island of 1981 titled the Royal Wedding. NORFOLK IS.1978 CORONATION SET SG 207-208 MNH. 1978 CORONATION SET. NORFOLK IS. SG 207-208.
:- The item you receive may not be the item scanned, but will be of similar quality. Year of issue: 2000. Stanley Gibbons No. : 733-734. No Exclusions. FINE CONDITION. Country/Region of Manufacture Norfolk Island. 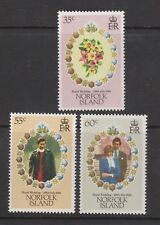 NORFOLK IS.1981 ROYAL WEDDING SET SG 262-264 MNH. NORFOLK IS. SG 262-264. 1981 ROYAL WEDDING SET. S.G. 948 to 950. UK: £0.00p.